Welcome to my blog which is all about food. I have got lots to say. Lets start with terrine. 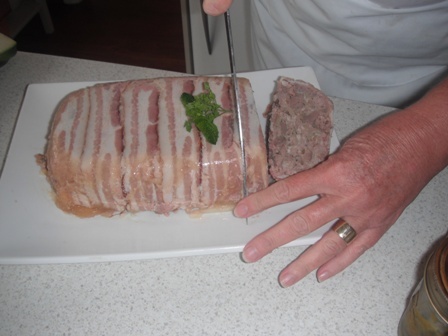 I’ve made pate and all sorts of other things with offal but I really wanted to master a professional looking terrine. Stephanie Alexander was the first place I looked. There it was! Simple country terrine. And it is really simple especially with my friend Elizabeth delicately putting the bacon wrapping in place. Don’t be put off by it cooking in a bain-marie. It’s just a simple water bath. And you don’t need a flash terrine dish. Improvisation is to be applauded. The fabulous meat: fatty minced pork, minced chicken, and chicken livers all came from Martinborough butcher Scottie’s. The idea is wonderful, the photos are gorgeous – if only we could taste online as well! I look forward to making it for you one day soon! FABULOUS – just another bow to your long list of credentials. Well done looks great.